Precasters perform dangerous life threatening tasks every day. Each day we get a little more comfortable standing near a 56,000 lb. piece of box culvert suspended in the air or standing next to a 17,000 lb. transport bucket holding freshly mixed concrete ready to empty into a form you are standing next to. Why is it that we take lifting so lightly? You have your material certifications and safe working loads (SWL) for your lifting anchors. The SWL far exceeds your products weight and there is an additional 4:1 built-in safety factor. For example, you have a 56,000 lb. precast concrete product. You would typically purchase four 8-ton lifting anchors that give a combined SWL of 64,000 lb. You pour the product and strip it 18 to 20 hours later at a concrete strength of 2500 psi. This typical everyday plant activity could have just fatally injured someone in your plant. Selecting the appropriate lifting anchor is generally worked through from finish to start, meaning the total weight of the product being lifted is used to size the lifting anchor. This is a common mistake, and a mistake that can fatally injure an employee. Precast plants do not strip products out of the form 28 days later at a concrete strength of 5,000 psi. Stripping the product typically occurs between 18 and 20 hours from the time the product was poured. The concrete strength at this time is generally below 2500 psi. Therefore, in order to correctly size a lifting anchor you must work the problem starting at the stripping strength. Working through the sizing the correct way and highlighting the hidden dangers of sizing a lifting pin for a box culvert is an eye opening experience. In this example, edge distance, minimum distance between anchors, lifting sling angles and other factors will not be addressed. An order comes in for a box culvert that will have a total weight of 56,000 lbs. per piece. The product will be poured once per day and stripped 18 hours after it is poured. Based on years of history with your proven concrete mix design, it is known that the concrete strength in 20 hours will generally be 2,250 psi. Each box culvert will have four lifting pins that will be used to lift the box culvert. The top thickness is 15” due to site conditions and engineering requirements. In order to get the SWL of 56,000 lbs. at the time when the product is lifted out of the form, we must reference Chart 1 to find the appropriate lifting pin(s) that will work for this product. 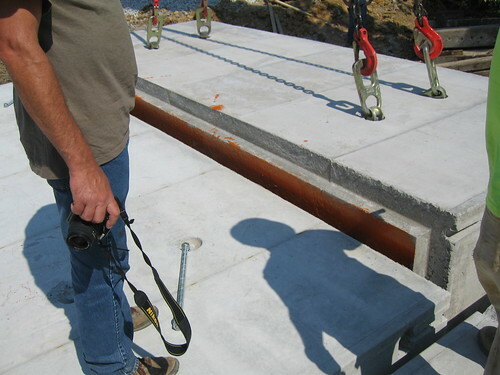 Since 2,250 psi concrete is not listed in Chart 1, the 2000 psi concrete strength column is referenced because it is equal to or the next lower listed strength available. The 13-3/8 inch lifting pin will be used in order to have a SWL of 14,900 lb. per lifting pin or a combined 59,600 lb. at a concrete strength of 2,250 psi. This is safe lifting pin selection for lifting the product out of the form. The percent decrease in SWL between 1500 psi and 2500 psi on the 13-3/8 inch lifting pin is approximately 47%. Interpolating SWL capacities by formulation between concrete strengths should be done only by the supplier familiar with the application and product. It is important to note that many lifting anchors carry a title that is not based on SWL. The lifting anchor’s SWL has more to do with the specific lifting eye used to pickup and move the plant. A common mistake is to choose an 8-ton lifting pin that is the most inexpensive for the job but appears to be adequate. This is a common mistake made if not properly informed. This is a problem many precasters are not aware of through a lack of information and guidance through lifting anchor suppliers. Looking back on the chart there are five different length 8-ton lifting pins with the shortest being 4.75 inches. The chart lists the lifting pin having an 8-ton SWL, and the current economy encourages the production manager or purchasing agent to use the most inexpensive lifting pin available. If the 10 inch lifting pin is used for the 56,000 lb. box culvert, a minimum concrete strength of 3500 psi would be needed in order to safely lift the product within the SWL. Typical 5,000 psi mix designs and curing techniques would take 3 to 10 days to reach 3500 psi. This approach may not be feasible if the form is needed for other pours. Wall thickness can sometimes be an obstacle when sizing lifting anchors. If the wall thickness in the example above had been 12 inches instead of 15 inches, the 10 inch anchor would have to be used. This is important to know for production scheduling so a mix design with stronger early strength times could be used to overcome the delay in production or planning. The alternative to increasing the strength in the mix design would be to leave the product in the form for several days until the concrete has reached the appropriate strength. Now that the correct way to size a lifting pin has been established by highlighting the common pitfalls, take the time to collect the reference materials showing the SWL at varying concrete strengths from your lifting supplier. If your supplier cannot provide you with the needed reference material to size lifting anchors at the time of stripping, consider reevaluating your relationship with that supplier for one who has the reference material. Everyone needs to go home at the end of the day, and no one wants anyone to get hurt or fatally injured because of a simple misunderstanding. 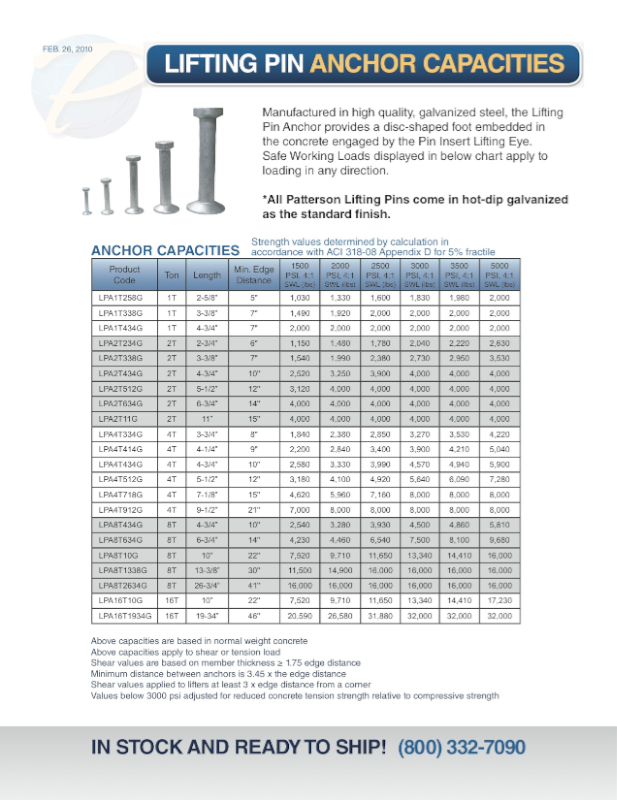 Before you cast your next lift pin, utility anchor, or pulling cable into a precast concrete product, please think about the aforementioned information and make an informed decision when you size, purchase, and use your next lifting anchor. It is critical to size the lifting anchor based on concrete strength at the time the product is stripped from the form. You can’t afford not to do it right the first time because there may not be a second time. Four lifting eyes latched on to the lift pins in their recessed voids. Photo courtesy of BargerAndSons.com. Lift pin in recessed void. Photo courtesy of BargerAndSons.com. Chart 1 Below - Link to full brochure here.